There are 285 species of squirrels in the world, ranging in size from African pygmy squirrel to Alpine marmot - a ground dweller about twice the size of its American marmot relative, the woodchuck. The extended family includes about 45 species of flying squirrels and 15 species of marmots. Eastern Massachuetts is host to five species, in size from smallest to largest: eastern chipmunk, southern flying squirrel, red squirrel, gray squirrel and woodchuck. Each of these occupies an overlapping ecological niche, so they co-exist without competing too much for habitat or food. Two hibernate (chipmunk, woodchuck), while the other three get by on a combination of cached food and what can be found in winter - nuts and seeds, but also leaf buds at the tips of branches. Over-wintering gray squirrels create insulated nests either by making a leaf ball in the fork of a tree (the structure is called a drey) or inside a hollow tree trunk. Or inside an attic, which for them is squirrel heaven - warm, dry, safe from predators, and if they get bored, there may be electric wires to gnaw on. Each year, thousands of building fires are attributed to squirrels, rats or mice gnawing on wiring. 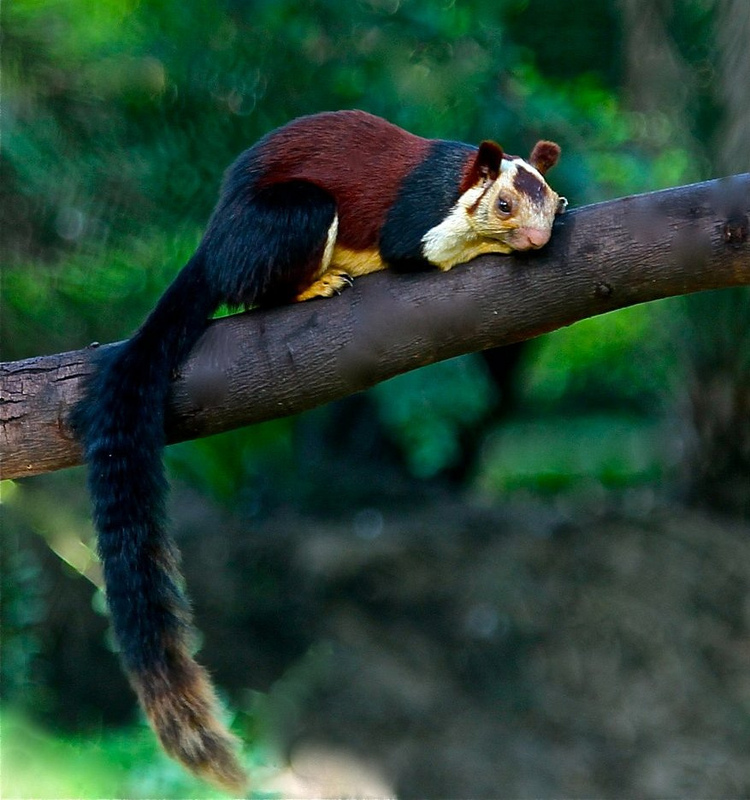 Anyone suspecting they have a squirrel problem should contact a professional pest control company without delay. The eastern gray squirrel species comes in three color variations: gray, black and in-between, the last from getting genes from one gray and one black parent. Black is more common in the deep woods of northern U.S. and Canada, while the gray coloration prevails in less wild territory. The thinking is that color helps squirrels avoid predation by eagles, hawks and owls - black better in the shadows of deep forest while gray preferred in terrain with more daylight. Individuals do not appear to show a mating preference based on color. Yet there are examples of black replacing gray in suburban areas. 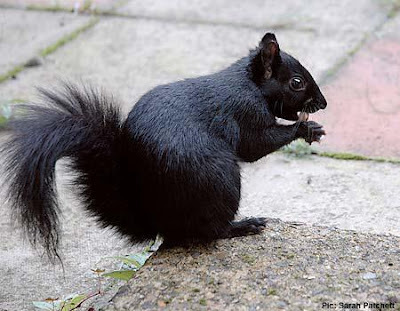 There is speculation that in addition to the camouflage benefit, black squirrels displace gray squirrels because of more aggressive behavior, or because genes adjacent to the color genes code for a more effective immune system, or because dark hair helps capture more heat from winter sunlight, thus helping with survival. None of these theories have been proven or disproven. The gray of a gray squirrel is actually a mix of colors. Each hair follicle starts hair growth, continues for a set period, then stops. After a while the hair detaches and the follicle starts again. The process is ongoing all year, but there are bursts of hair growth in the fall, to create a warmer winter fur, and again in the spring when the winter coat is shed. Each hair starts growing as white (without melanin color). Stomach hairs stay white. As face, back and leg hairs continue to grow, most of the follicles will change to producing a brown/orange tone or else black. The combined effect is a gray coat, but with brown/orange tones more evident on face and tail. A mutation in the DNA that codes for control of hair color causes all hair to start as black and stay black, resulting in all-black squirrels. Gray squirrels are predominant in most of Massachusetts. However, Westfield, MA, a bit west of Springfield, was the site of a deliberate introduction of black squirrels about sixty years ago. The founder population of less than a dozen proved to be successful, as part of central Massachusetts as far away as Amherst now have a sizable black squirrel populations. Sightings are rarer farther east, but there are many confirmed sightings in Stow and in Maynard (the latter, most recently behind buildings on Railroad Street). Other mammal species have black variants. The South and Central American jaguar has a yellowish/brown coat with dark blotches, but about five percent have a near-black melanism and are known as black panthers. (Interestingly, the North American cougar, also at times referred to as a panther, does not have a melanistic variant.) North American gray wolves also exhibit melanism. For both predators, the darker color is linked to better hunting success from better camouflage. Dark wolves are more common is deep forest and less common in tundra or broken forest habitat. While wolves do not (presently) inhabit Massachusetts, it's nice to be able to see a black squirrel in Stow or Maynard and be reminded of the larger world. Squirrels are omnivores. 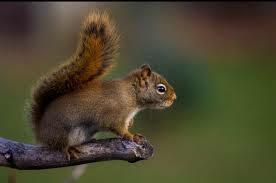 In addition to nuts, seeds, leaf and flower buds, squirrels also eat insects, bird eggs, baby birds, etc. Winter storage of food - primarily nuts and bulbs - is by scattered hoarding. This means each item buried individually, but within the territory of the squirrel. Recovery is by remembering the general area and then using sense of smell to decide where to dig. In contrast, chipmunks do cache hoarding, with large amounts of seeds stored in one place. Squirrels will dig up and rebury small flowering bulbs such as crocus and snowdrop, but usually do not dig deep enough to get to tulips and daffodils. 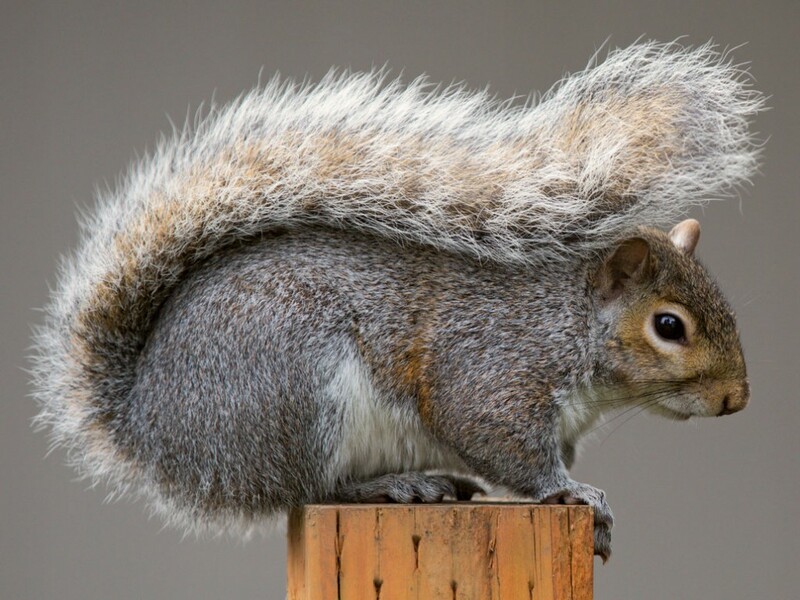 American gray squirrels are an invasive species in England, Ireland and parts of continental Europe - displacing the native red squirrels through a combination of competition for food and introduction of squirrelpox virus. P.S. 'Gray' is the preferred spelling in the U.S. while 'grey' is preferred in Europe.